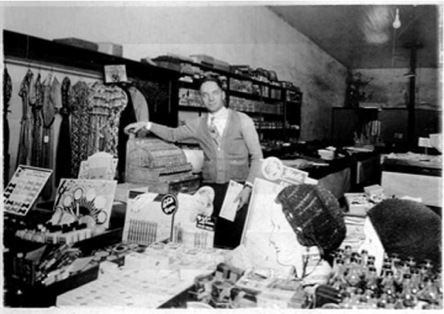 Daddy’s store was located on the south side of the Courthouse Square. His was one of the few places clothes could be purchased. These were mostly overalls, simple print dresses, and what we called overall pants. He also sold cosmetics, toiletries, shoes, school supplies. toys and novelties. Although he kept the store open everyday except Sunday, most of the sales were made on Saturday. There was no specific closing time on Saturday, just when the crowd went home which was usually quite late. Often Mother helped in the store on Saturday and I stayed with them until closing, usually going to sleep. I’d wake up on Sunday morning at home having been carried there the night before by one of my parents. It was common for those operating businesses to wear a tie and suit. It might be the same tie and suit each day but overalls, which most farmers and other workers wore, were not appropriate. Most men also wore wool hats no matter how they dressed. One early Sunday morning we were awakened by a man wanting my daddy to open the store to sell him some clothes. He said he had to go to a funeral and didn’t have anything to wear. Daddy put on his usual attire, the suit and tie, and went with him to the store. Money was scarce and every opportunity to make a sale was important. Daddy arrived back home after about an hour wearing a pair of overalls.